Durable and smartly designed, the Winco BHOP-11 Solid Basting Spoon with Stop Hook, 11" is a must-have for your commercial kitchen. 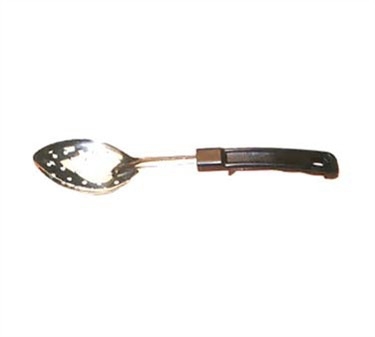 This non-perforated basting spoon is great for spooning pan juices over beef or poultry, or it can be used to transfer food from cooking pans to storage containers. The 11-inch basting spoon features a sturdy, easy-to-grip Bakelite handle with a stop hook that prevents the spoon from slipping into the pan, bowl or container.